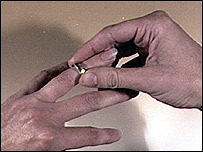 Marriages between first cousins should be outlawed because of the risk of passing on illnesses, a Labour MP says. It follows BBC research into British Pakistanis, at least 55% of whom are thought to be married to first cousins. The research found British Pakistani families were 13 times more likely to have children with recessive gene illnesses than the general population. Keighley MP Ann Cryer said British Asians had to be persuaded to end the tradition of marrying first cousins. The investigation, carried out for BBC2's Newsnight, found that while British Pakistanis accounted for just 3.4% of all births, they had 30% of all British children with recessive disorders. Ms Cryer said: "As we address problems of smoking, drinking, obesity, we say it's a public health issue and therefore we all have to get involved with it in persuading people to adopt a different lifestyle. "I think the same should be applied to this problem in the Asian community. "They must adopt a different lifestyle. They must look outside the family for husbands and wives for their young people." Ms Cryer told BBC News the sooner a debate on the matter was begun the better to encourage the Asian community to address the problem themselves. "There is something very wrong going on," she told Newsnight.